t*rexes and tiaras: The animals went in two by two.. I've shared a few of my favourite outfits from it on here so far, although more can be found on my IG profile. 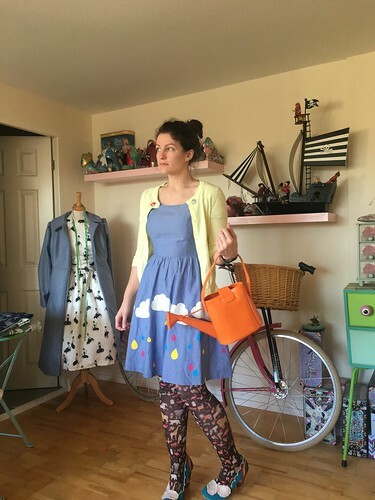 This outfit was part of animal theme week, and it all started with these tights, which I'd tried hard to track down last year when I saw someone else wearing them on IG. I love a pretty pair of tights and these animal print ones are perfect for my #wardrobezoo aesthetic. I managed to find out from Topshop HQ that the final remaining pairs were in their flagship London store and one of my lovely #teamunicorn friends swung by to pick a pair up for me. Since then, they'd sat in my box of tights, waiting for the right moment for inspiration to strike. I decided that they'd go quite well with this dress, with it's colourful raindrops and decided on these Shirley Bass rainbow heels, too. Figuring we had something of an impromptu Noah's Ark theme forming, and that it was raining, this umbrella print raincoat seemed the natural coat to opt for. 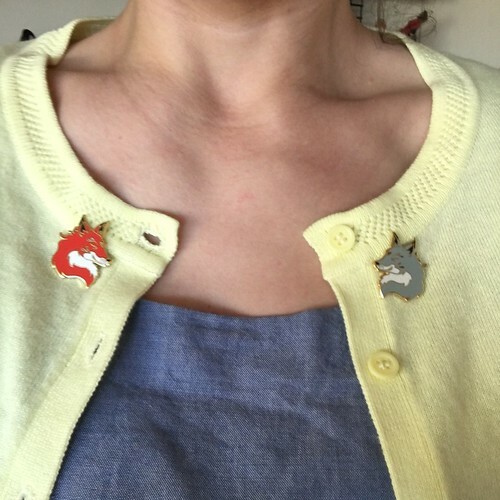 These fox collar clips remind me so much of the foxes in Farthing Wood. A TV show I adored as a child, I was thrilled to be surprised with the DVD box-set last Christmas but haven't yet got around to a re-watch. 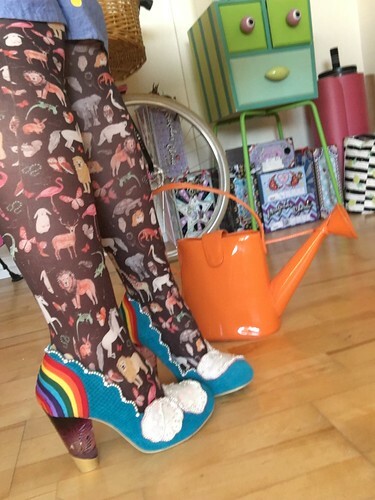 I don't know if I can cope with the heart-breaking fate of so many of the animals..
My bag, shaped like a watering can, seemed like a good addition to the theme and somehow I felt more put-together than usual, if a little bit weird. I guess I'm pretty used to weird, though. It really was. A conversation we had last night reminded me of the Butcher Bird as well. Argh. I adore this outfit! 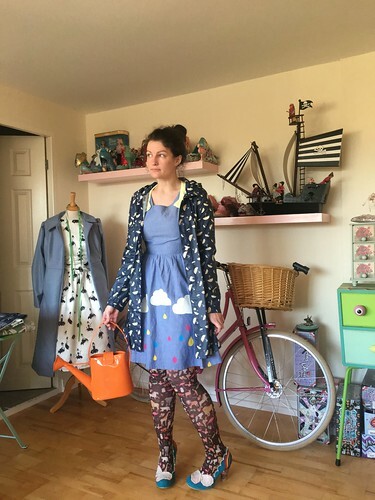 You know I'm a big lover of the dress but the other elements are really cute and compliment the outfit well-fox pins, watering can bag, amazing tights, those are my favourite IC shoes! Oh my goodness I *loved* Animals of Farthing Wood as a child, even if I went to school upset each day as yet another animal had died. Haha! They don't make children's tv like they used to! There's no way they'd make such a beautiful yet traumatising show for children. Anyway, I love your impromptu Noah's Ark themed outfit. It's a bit bonkers but totally all works together. Kezzie is right, novelty outfit challenge was perfect for you! No, I was thinking this. We used to be eager for the next week (was it weekly? )'s show and I'm sure there's nothing as serialised for kids these days, let alone as traumatic. It looks fantastic all together. I've loved seeing all the smileandmake outfits. I loved Farthing Wood, no rewatch for me as it was too darn sad! Love it all! Especially the shoes!